The incidence of Tuberculosis (TB) is baffling in developing countries due to the increase in multidrug-resistant and extensively drug-resistant TB. Therefore, drugs acting through different mechanisms are in dire need to counter the resistant strains. Various chemical scaffolds are being investigated against tuberculosis, among them the molecules containing phenothiazine nucleus are found to be more effective against both susceptible and resistant strains of M. tuberculosis. In addition, the efficacy of first-line drugs has been found to be enhanced on supplementary treatment with phenothiazines. The present review provides an overview of the phenothiazine based molecules which were investigated during the last ten years for their anti-tubercular activity. Keywords: Phenothiazine, psychotropic, repurposing, resistance, SAR, tuberculosis. Keywords:Phenothiazine, psychotropic, repurposing, resistance, SAR, tuberculosis. Abstract:The incidence of Tuberculosis (TB) is baffling in developing countries due to the increase in multidrug-resistant and extensively drug-resistant TB. Therefore, drugs acting through different mechanisms are in dire need to counter the resistant strains. Various chemical scaffolds are being investigated against tuberculosis, among them the molecules containing phenothiazine nucleus are found to be more effective against both susceptible and resistant strains of M. tuberculosis. In addition, the efficacy of first-line drugs has been found to be enhanced on supplementary treatment with phenothiazines. 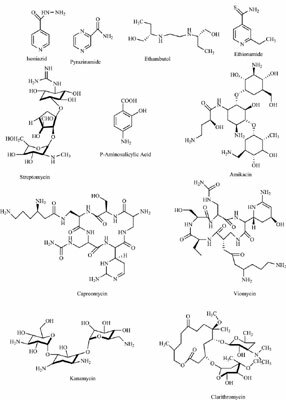 The present review provides an overview of the phenothiazine based molecules which were investigated during the last ten years for their anti-tubercular activity.